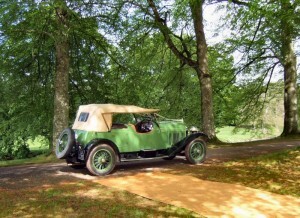 Darracq XS1735 had, in the words of her restorer, Chris Pyke, “a bloody hard life”. In the absence of the original speedo, the mileage can only be guessed at, but is probably no less than 150,000. The only early details known so far are that the original registration was in Paisley on 30 October 1926, a fortnight after the Olympia show closed, but no claims are made that XS 1735 was the “show” car. The car was owned and run between 1933 and 1953 by Andrew (Andy) Pattison, a partner in a motor engineering firm in Church St, Inverkeithing, Fife. A photograph from a local historian in Inverkeithing dates from around 1935 and shows XS1735 in front of the Church St garage. Andy’s brother, Jock, who was in charge of engine rebuilds is standing in the doorway. July 1944 is the date of the last tax disc on record before restoration. The late Colin Duncan who worked for Andy said that XS1735 was pulled out of the back of the garage at Church St when petrol rationing was dropped after WW11 and put back on the road for occasional private hire/taxi use – presumably in the days when trade plate regulations were less stringent. 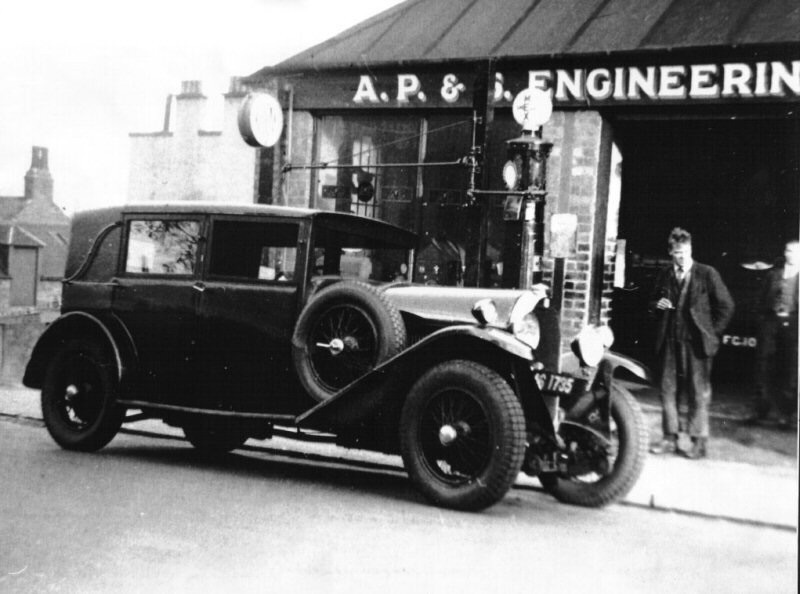 A piece of anecdotal evidence gleaned by chance from a scrapyard proprietor in Kirkcaldy circa 1970 was that “old” Andy Pattison along the road used to have a Darracq in which he raced the fish train south from Aberdeen. Confirmation of the fish train racing anecdote came eventually in December 1998 from the late Colin Morris, the 93 year old ex-provost of Inverkeithing and one time Chairman of Dunfermline Athletic FC, who provided the background reason for the Darracq to be in Aberdeen. In the 1930s apparently the railway would only carry the Sunday newspapers as far as Inverkeithing at the north end of the Forth Bridge. Andy Pattison had a contract to deliver these papers further up the east coast to Aberdeen. Colin recalled occupying the back seat on several of these trips and throwing out the papers as the Darracq passed through Cowdenbeath and the other towns en route. Andy was sometimes back home by 12 noon allegedly, a door to door average of over 41 mph, without the benefit of motorways or dual carriageways, but also with only minimal inconvenience from other traffic at that time on a Sunday morning in the churchgoing Scotland of the 1930s. Andy was a leading light in the Edinburgh and District Motor cycle Club, and a regular competitor on Ariels in the Scottish 6 Day Trial, while his brother, and engine rebuilder, Jock, rode Nortons in the amateur Manx Grand Prix. The internal mechanical evidence was that continual attention was required to keep the car on the road. There was hardly an area of the car which had not been subjected to repair at some point. Examples included 4 shock absorbers of which no two matched, differing numbers of leaves in the front springs, a brazed rebuild of the centre bearing housing in the torque tube, a relatively new crown wheel and pinion with indelible evidence on the alloy differential carrier of the fate of their predecessors, a patch repair to the o/s rear corner of the sump and a close bolted fishplate repair of the offside chassis leg where it had cracked. As exhumed from behind Gray’s bus garage in Clackmannanshire in 1964 by a Kilsyth solicitor, Alastair Mathie, the wheels were lacking some spokes but her tyres were still capable of inflation. Two were totally bald, one was just about legal and the remaining two were ribbed remoulds such as might be fitted to agricultural implements. Brakes and steering were still superb however and after being sold to the current owner, Bill Clark, she covered probably around 120 miles on the end of a tow rope with the tattered and rotten remnants of the Weymann body in place before being reduced to a bare chassis and dismantled before restoration. History of XS 1735 in my ownership is less than happy, although hopefully with a happy ending. As I have already said, my assessment of the Weymann body was that it was beyond reclaim when I bought the car in 1966. The timber framing was either split or rotten, bracing wires had rusted through with the result that the doors lozenged when opened. My decision was therefore to rebuild as a sporting tourer. Other than a personal preference for roofless cars, I would justify this decision on two grounds, firstly cost and secondly, with the other two surviving TLs being Weymann saloons, I saw little point in recreating a third. A visit to the Fife Historic Vehicle Club’s cavalcade at Lathalmond produced some further information. One spectator told me that he reckoned that XS1735 had lain abandoned on the front at Kirkcaldy between 1955 and 1957. The state of the wheels would support this but the car’s relative completeness and unvandalised condition makes it doubtful. Another said that he had served his time at Lamond Engineering and one of his jobs as an apprentice was to machine splines on a new pair of half-shafts for the Darracq. 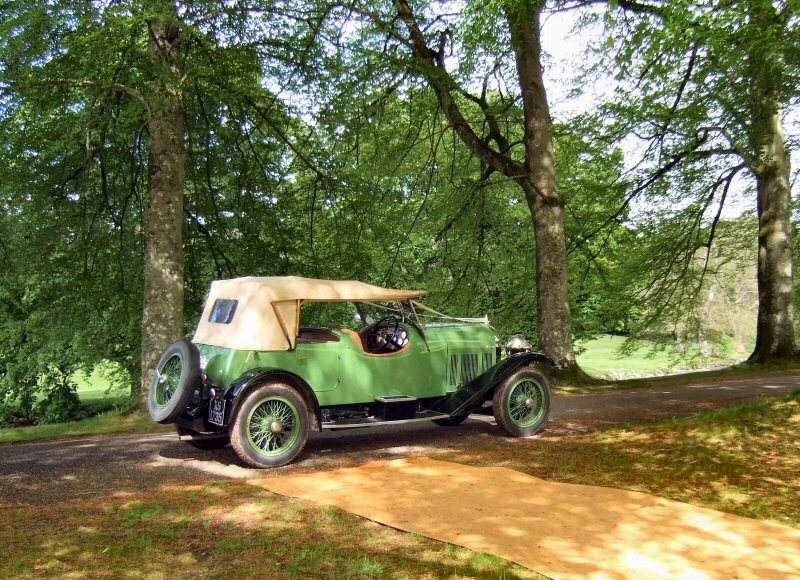 Comparison with another Darracq DUS tourer recreated by Laurie Smith indicates a remarkably parallel approach by our two minds working totally independently – both bodies are three doored with non opening V-screens, a small intermediate deck between front and rear cockpits, stowage space for side screens below this deck, modest storage accommodation behind the rear seat, bench front seat and rear mounted spare wheel. XS 1735’s hood is browed over the screen in unashamed imitation of the ex-Zborowski Hispano H6 which went from the Sword collection to the Doune Museum – LS adopted a similar layout but with avery shallow screen. LS adopted a more flamboyant approach to providing flared wings and side steps, whereas I have basically retained the original Weymann items with the front wings slightly tapered and restored the running boards. Neither of us has mounted a pair of the original and characteristic Marchal headlights – XS 1735’s are actually a pair of Bleriots, identical to those fitted to the Hispano and a present from Davie Frew, who looked after the Hispano while it was in the Sword collection at Irvine. The Bleriots are externally adjustable for focus and fork mounted on reproductions of the original Darracq mounting brackets. Following simulation with concrete blocks approximating the new body’s weight, the rear springs were decambered by 1” to reduce the ride height by 2” to what is hopefully the original figure. The problems which caused the twenty five year hiatus in progress with restoration were basically financial pressures (how can you spend a four figure sum restoring a radiator when you have four delightful children with associated education costs ?) and failure to prioritise. Was it Confucius who said “he who chases two rabbits catches neither “ ? Anyway, a chance meeting with Chris Pyke at a Rover track test day in 1994 followed by a revised financial situation in late 1997 combined to produce a start in early 1998. The end result hopefully speaks for itself.